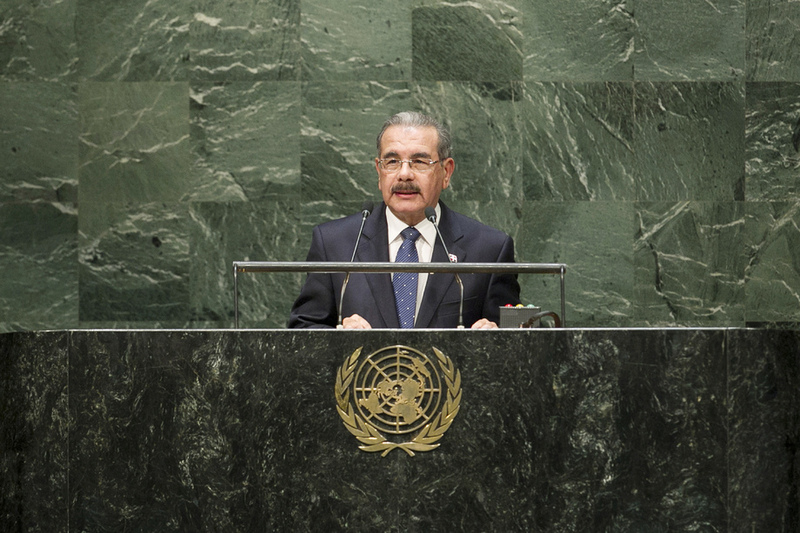 DANILO MEDINA SÁNCHEZ, President of the Dominican Republic, said that the crisis begun in the industrialized countries six years ago had spread throughout the world, placing the welfare State, which had produced some of the greatest progress in history, in jeopardy. Social justice was being endangered in the countries of its origins, yet it was starting to thrive in emerging countries. The Dominican Republic had set itself the goal of becoming a people-centred developed country, he said, spotlighting education as a priority in that process, and noting programmes were in place to ensure that all girls and boys had access. Shortly, the country expected to be free of illiteracy. The welfare State was creating improvements in health and in supporting small agricultural producers, and there was a renaissance of the Dominican countryside, enabling it to feed the country. Poverty had been reduced by 6 per cent, and in rural areas by 9 per cent. Turning to other parts of the world, he said that today’s numerous conflicts were the result of holding on to past grievances. There would always be those who wanted to keep those alive, without any compunction about causing people harm. There were others who looked to the future and a world they would like to create for their children. In that regard, an historic agreement had been reached between the Dominican Republic and its neighbour on the island, Haiti. The two had a history of past conflicts, but “our history is extremely rich”, and there were positive aspects to be found when the search continued to find ways to improve people’s lives. Together, they were discovering that old wounds did prevent advancing along that path. In fact, taking those steps helped to close past wounds. He urged the international community to support the new era between Haiti and the Dominican Republic, by helping their people receive the documents they needed to establish their countries of origin. That was also fundamental to providing them with social services. “Please help Haiti document its people, both in its own territory and in the Dominican Republic,” he said, urging all not to allow “a few technical deficiencies to be an obstacle” to such a hopeful time for the two countries. In closing, he said the economy was not a prison, but could be a tool used to improve people’s lives. Finally, he called on Member States to make education and health care for all a fundamental human right.